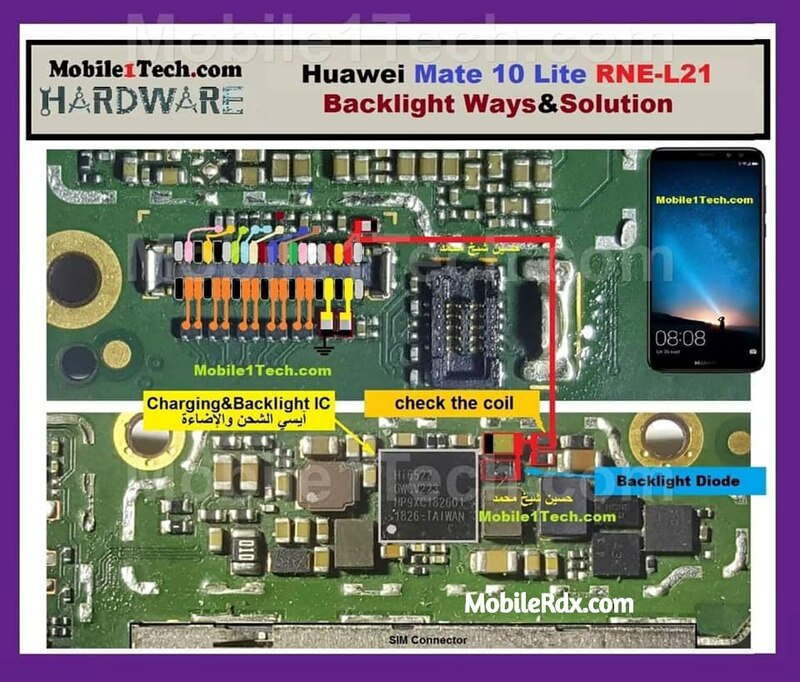 Repairing__for the “Huawei Mate 10 Lite display light ways” with image diagram. The user also learn for how to? solution *If display lights are not working__dark display, damaged display connector issue. Today! I am going to share with you__How to fix the missing display light error into Huawei Mate 10 Lite RNE-L21. As you know! The cell phone display has a LED (Light emitting diode) system for the brighter screen. With the build-on display lights, __User can see mobile screen data into the dark places, night mode. If the display back-lights have any issue. The user can face the one or more following issues (Errors) problems with there cell phone display. There is no light at the display. Mobile phone power on but nothing on display. All other functions are working but the LED’s are going faulted and nothing at the display. Front panel, display connector is damaged, missing or not working. Something is missing. There is not current at the display connector light pins. Make Direct jumper in Huawei Mate 10 Lite RNE-L21 phone. To resolve__There is the dark display of Huawei Mate 10 Lite phone. You need to unplug the battery first and approach to its motherboard after UN-boxing from its inner or casing. This cell phone Huawei P8 Lite need extra care during UN-boxing from its body. You need to follow the image color lines for the direct jumper ways at missing display connector light pinpoints. As the above diagram here__The BLUE line is used as the positive pinpoint jumper from display connector to display light controller chip. The green is used as the bios and yellow is the negative pin jumper. Make sour! Display lights are working very well. During making the direct jumper with the jumper wire. Confirm before any job__That pin is not showing at the testing meter and you have a good experience to micro places jumper. How To Repair Huawei Mate 10 Lite RNE-L21 Display Light Problem? First, you need to confirm from the mobile setting menu. If the display lights setting is active and there is no issue of disabled lights function. You need to repair this issue (Dark display) display light is not working from the hardware repairing or troubleshooting. Clean both connector at motherboard and display strip links pinpoints. After cleaning try to test your issue by power on your cell phone. The problem is coming from missing light pinpoints commonly. Try to make direct same as image diagram above here. If the light current is showing at the connector pinpoints. Test and replace the display lights LED. If there is no current at the connector pins. Try to clean or test the light controller chip. For the faulted display lights from the front panel, __You need to fix it by repairing the lights section. If the problem has been solved by this guide. Please subscribe to us and share it with your friends or the public. For other reasons or inquire. Feel free to communicate with us by contacting us or you can leave your comments into comments box free.